The following directions should cover most journeys heading to our cattery – look out for the white and purple road sign! Traveling down the A15, go straight around the roundabout over the M180 and take the A18 signs for Humberside Airport. Pass a roadside Cafe on the right and you come into Melton Ross. Take the first right (a tiny road) after you enter the reduced speed limit signs.Follow road all the way into Bigby. At the T junctionturn left up the hill signposted for Grasby and Caistor, pass Somerby Top on your left, and take the next left sign-posted Searby Top. (N.B.The post is currently missing courtesy of a car crash so look for our sign in the left hand hedge) We are 1 mile down the road on the left. From Caistor take the road to Brigg, past by Grasby and Owmby, and take the next turning on the right for Searby Top. We are 1 mile down the road on the left. 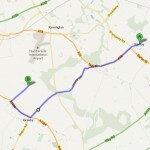 From Keelby, take the A18 towards the Airport. At Great Limber, turn off next to the New Inn Pub, take the road to the left of the Post Office/General Stores towards Grasby. Follow the road through to a Crossroads. (Right is the airport and left is Caistor) Go straight over and you come to another crossroads with the Crosskeys Pub opposite. This road to the left and right is the A1084. Turn right. About 1-2 mile along this road is a turning on the right for Searby Top. Turn right and we are a mile down the road on the left.